This is a phone by an Indian manufacturer, which is unusual since they are not really known for their electronics, though it does make sense that they would start building their own discount phones. There are a lot of people in India, and being able provide them with cheap Smartphones is surly a good business idea. There is a Micromax Canvas Turbo A250, but this is the A200 mini version which is also rather cheap as oppose to being smaller. What is it like to hold? It is a comfortable and it does not feel cheap. It does not feel as if it will break if you drop it or squeeze it too tightly, so as first impressions go it makes a good one. It has a 4.7 inch screen. This is pretty standard for a Smartphone, and it is a nice size for easily fitting in your pocket without slipping through your fingers. It is a middle of the road price. In India they have released the price of to 10,000 to 15,000 INR, which is $160 to $240 in America. Considering that the newest iPhone is going to cost you around $500, it is pretty impressive. You get to watch the screen with a fantastic 720p HD resolution. It is 4.7 inches, which is perfect for a phone, and it has 312 PPI. It is very impressive when you see it, and it helps to add to the overall quality of the phone. It runs on Android 4.2 Jelly Bean, and it works with two SIM cards and a standby function. It is a well put together phone. It doesn’t weigh too much, but does not feel cheap and light either. The case is plastic, but it does not feel tacky in any way, and the display in HD makes the visuals on the phone stand out all the more. It is a very good phone. The Micromax Canvas Turbo Mini A200 Smartphone with HD has four GB of memory installed within. You can expand this up to 32 GB with a MicroSD card. The internal storage is better at quicker storage and retrieval, but if you are using the HD camera then that shouldn’t matter. The battery is just an 1800 mAh, which is not very big at all. It gives you 180 hours on standby and around six hours of talk time. However, you must remember that this is the mini version, and on most phones the single biggest component is the battery. The battery on this one is small in order to keep the weight and size of the device down. It is not small in real terms when you compare it to many other Smartphones. You get 1GB of RAM on your phone, which is a large amount for a phone and will ensure that you have a very smooth performance on your phone. It will ensure that your phone does not crash on you any time soon. It has four processors, and each is clocked at 1.3 GHZ. It is the MT65822 SoC processing unit, and it has 2 Mali 400 MP2 GPU cores. It is not a very fast phone, but the programming on the phone does allow it to go rather faster than many other with similar specifications. The Micromax Canvas Turbo Mini A200 Smartphone does have a HD camera, which is very impressive for such a small phone. It also comes with an 8 mega pixel camera, which is a step down from the other versions. Other Micromax Canvas phones have a 12 or 13 mega pixel camera, so why the difference? Turns out that it is not an attempt to make the phone cheaper, but is actually because the installed MT6582 Chipset has limitations which made the developers go for a smaller camera. Unlike other phones that only have a 2 mega pixel camera on the front; this phone has a 5 mega pixel camera on the front. The front camera has a fixed focus shooter which is quite advanced, and it has an object eraser and Cinemagraph. If you expand the phone with a MicroSD card, then using the HD camera may be a lot of fun. It catches crystal clear images without a darkening of the scene or any sort of blue or yellow tinge. The HD camera on such a small device is very impressive. Very Good features compared to old version.. planning to buy one in month.. 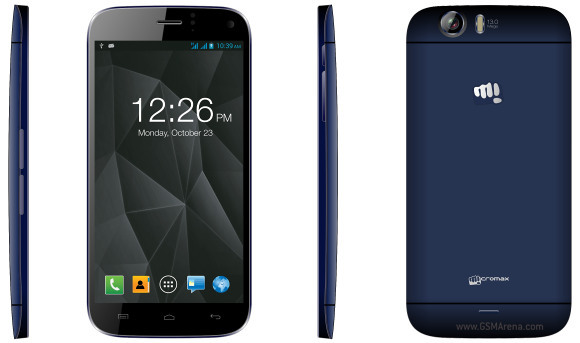 Excellent Micromax Canvas Turbo Mini A200 Smartphone with HD information. thank you for sharing.